State lawmakers are back in Austin to kick off some legislative overtime. And, as it’s been reported over and over and over again, the special session is needed because lawmakers couldn’t pass a bill to keep a handful of state agencies open and operating. That got some of our listeners wondering if lawmakers could’ve spend their time at the Capitol a little more efficiently. Austinite Kelly Harper asked our TXDecides project with public radio across the state two questions. The first one’s pretty easy. The short answer is yes. In fact, the Texas Legislature wrapped up the 2015 without any extra work needed. And over the past 13 sessions, seven did not have one. But Harper has a point. Special sessions are seemingly baked into the Texas legislative process. Historically, lawmakers have often gone into extra time – starting as far back as 1850, after the state’s 3rd regular session. So, on to Harper’s second question. OK, to answer this, let’s start with the Texas Constitution. The Legislative session is only 140 days long. 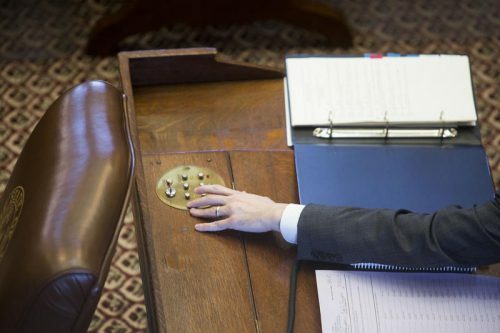 The state’s constitution says lawmakers can’t pass bills for the first 60 days – which means the Texas House and Senate have to wait until about 43 percent of the way through a session before they can pass a bill. Sure, any item deemed an emergency by the governor can be taken up and voted on immediately, but that’s usually not more than a handful of bills. Hugh Brady, director of the Legislative Lawyering Clinic at the UT School of Law, says to understand why those rules were put in place, you have to understand what life was like for lawmakers in the 1930s – when the constitution was amended to include the new deadlines. But what might have been necessity in the ’30s has become today’s political tool. Almost every legislative session, lawmakers from both parties have complained about how long it takes to pass a bill – especially when some legislation zips through that same process. Stickland and other Tea Party Republicans have been the most recent vocal opponents of the slow process. But, of course, lawmakers passing more bills means more laws – something our question-asker Kelly Harper admits has its own issues. Watching lawmakers spend the start of each session sitting around, only rising to honor the Texas Pecan Queen, can be frustrating. But Brady suggests it was politics, not process, that led us to a special session. That sunset bill Brady mentioned is needed to keep open a handful of state agencies, including the Texas Medical Board. And, in the last days of the regular session, the Senate had a chance to pass it. “Senate Bill 310, the sunset scheduling bill is now in the hands of the Senate to pass. It’s very late, but we can still get it out,” Lt. Gov. Dan Patrick told reporters in May. He told them he certainly could pass the bill, but he wouldn’t – unless the House passed a bill to restrict bathroom access for transgender people. “If it doesn’t pass, then I’m prepared to go to a special session to get it passed,” Patrick said. The House didn’t blink and here we are at the start of a special session. But, Brady argues, making lawmakers work faster can also mean less time for constituents to know what’s going on. If you want a productive special session, we could get it this summer. Gov. Greg Abbott wants lawmakers to tackle 20 items during the next 30 days. Although, the chances that all – or even most – of those items reach the governor’s desk are considered slim. This entry was posted in KRTS News, KXWT News and tagged Texas Decides, Texas Legislature. Bookmark the permalink.